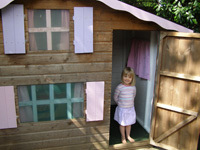 The popular Walton Daisy Den playhouse will provide hours of fun and amusement for your children. It is ideal for the smaller garden. 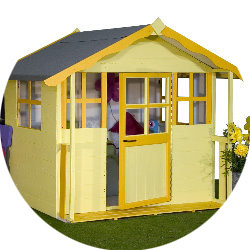 Built to exceptional safety standards to meet European Toy Standard EN71, Walton Honeypot playhouses are constructed with an attention to detail and their natural look will enhance your garden, while giving pleasure to your children or grandchildren. The building is T&G clad and the roof and floor are constructed using OSB (resin bonded board). Glazing is safety Perspex and the door is 2' x 3'6" (0.6x1.08m) in size. Please note, the depth includes the 10" (0.25m) verandah. 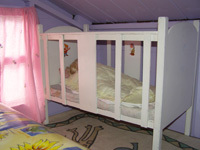 Self-assembly by customer (instructions supplied). 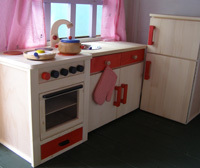 Supplied treated (shown painted for photography only).